Part 1 of the TED Radio Hour episode Inspire to Action. 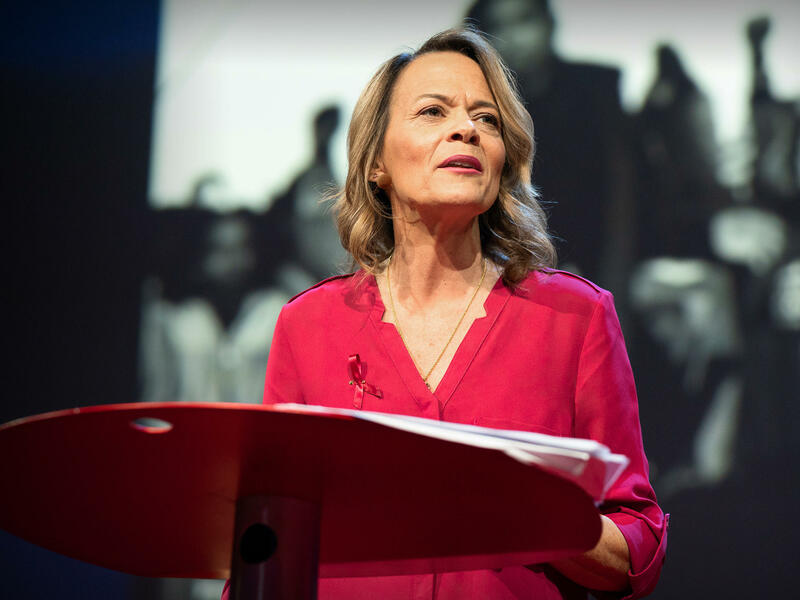 As a history teacher who lived through the horrific Parkland school shooting, Diane Wolk-Rogers describes what it takes for movements to inspire change — and how her students are doing that now. Diane Wolk-Rogers is an AP World History teacher at Marjory Stoneman Douglas High School in Parkland, Florida. She lived through the deadly shooting that occurred at the high school on February 14, 2018. She now fights for a safe learning environment in support of the student-led #NeverAgain movement, one of the most powerful social movements of 2018. It's the TED Radio Hour from NPR. I'm Guy Raz. So have you ever wondered what it would take to start a movement? UNIDENTIFIED JOURNALIST #1: Just a short while ago, astonishing news from East Germany, where the East German authorities have said, in essence, that the Berlin Wall doesn't mean anything anymore. RAZ: A movement that actually changes a culture or a society. UNIDENTIFIED JOURNALIST #2: There's Mr. Mandela. Mr. Nelson Mandela, a free man taking his first steps into a new South Africa. RAZ: Something that inspires people to take to the streets. UNIDENTIFIED JOURNALIST #3: The Arab Spring spreads to Egypt, celebrations as it was announced President Hosni Mubarak's 30-year rule had come to an end. DIANE WOLK-ROGERS: Movement, to me, is a revolution. And I teach world history, so I teach revolutions. It's a momentous change in ideas, in culture, in attitudes. RAZ: This is Diane Wolk-Rogers, and as she mentioned, she teaches world history to high school students. And Diane says most movements have a few things in common that make them successful. WOLK-ROGERS: You need to have a core group of leaders who can unite a population, who can organize the protest and the marches, who are eagerly engaged and have the resources to push this movement forward. RAZ: Not too long ago, Diane unexpectedly went from teaching her students about the history of movements to watching one unfold, a movement that happened to be led by those very same students. UNIDENTIFIED PROTESTERS: (Chanting) Never again. Never again. Never again. Never again. RAZ: Here's Diane Wolk-Rogers on the TED stage. WOLK-ROGERS: I teach history at Marjory Stoneman Douglas High School. On February 14, 2018, my school experienced one of the worst mass school shootings in American history. I don't remember everything, but I do remember I went into crisis mode. I lined up the kids. I held up a sign so they could follow me through the hall just like a fire drill. I heard shots from one direction. We made it outside. We made it to safety. How can we stop the senseless violence? This was the most difficult question I've been asked. And if you're not sure where to start, look to my students as role models. They are armed with incredible communication skills and a sense of citizenship that I find so inspiring. WOLK-ROGERS: There is a widespread popular anger at an injustice. That's why I say it's a revolution. You know, it's caused by exploitation. But this time, it's of our youth. It's of our public school kids. RAZ: Today on the show, Inspired To Action - ideas about what it takes to inspire people to take up a cause or follow a leader and produce real change and why some movements succeed and others don't. And Diane Wolk-Rogers says her students from Parkland remind her of leaders who inspired some of the greatest movements for social change. WOLK-ROGERS: Not only are these kids really bright and have terrific communication skills, but when I talked about emotional intelligence, they know how to yell without yelling. If you were there in Washington and you saw Emma and how she took that time to be silent, that, to me, was as powerful as Dr. Martin Luther King's "I Have A Dream" speech because when I went there, at first I'm thinking they're not getting it. They're not getting it. And then when Emma got up there and she said nothing and she forced people to start to feel and to listen to their own thoughts, that's yelling without yelling. And I was looking around at the crowd. I go, yeah, people are thinking now. People want change now. WOLK-ROGERS: These are public school kids engaged in the issue of gun regulation, and their endeavor has moved our hearts. And they shouldn't have to do this on their own. They're asking you. They're asking all of us to get involved. This isn't a spectator sport. So what's the right answer? I don't know. Listen. I'm no gun control expert. I teach the humanities. To be human is to learn, and to be part of a civilization is to share your knowledge. This kind of honest, brave and sincere engagement is what I asked of my students, what I expect of myself as a teacher and what I demand of you now. RAZ: When you look at the political landscape in the United States, especially when it comes to guns in America, do you think that that the situation can actually change? Do you think that this time, it's different? WOLK-ROGERS: Absolutely, it's different. Change over time is occurring, and that's one of the big things we have to teach in AP World History. Cultural attitudes have changed over time. At one of the wakes for one of my students, I was talking to the brother. And he sat there and he completely understood and said, you know, 50 years ago, everybody in America smoked. Nobody would have thought that there'd be a day where you can't smoke in a restaurant or on an airplane or even in a park. But, you know, look what happened. And I think what's really interesting about this group is, you know, they're not willing to wait. The adults didn't enact those changes, and now they're saying we're going to change the situation now. And they're not sitting around. They're not waiting for others. They've jumped on it. RAZ: Diane Wolk-Rogers is a history teacher at Marjory Stoneman Douglas High School in Parkland, Fla. You can see her entire talk at ted.com. Transcript provided by NPR, Copyright NPR.